Both kids are taking their naps at the same time. We told Chunguita that the Easter bunny comes and fills the eggs, like Santa with the stockings. That way, I figure I can keep using the same baskets and eggs for longer before she figures it out. It took forever to fill those plastic eggs. Chunguita got chocolate, gummy bunnies, stickers, tattoos, lip balm rings, lipbalm lipsticks that look just like mine. DH got up early and hid all the eggs. DH just built a closet for the TV & assorted electronic media that he has. It’s 2 shelves that go back 2 feet, are 3 feet wide, and are 2 and 3 feet tall. At one point in the process I suggested that we turn them into Skinner boxes. We could put Chunguita in the bigger one, and Pulguito in the smaller one. Then shut the doors. I think they were both screaming at that moment. We decided to go ahead and put the TV and electronics in them. Dolman sleeve t-shirts with a v-neck, boat neck, or drapey neck, and long sleeves, flouncy short sleeves, or tank. 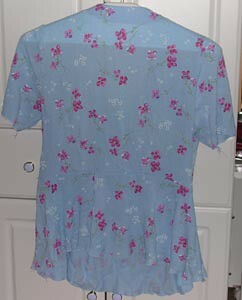 I made view B, drapey neckline w/flouncy short sleeves. It’s a snug fitting t-shirt. Pretty much. I thought the drape was more pronounced in my top than in the picture. On the top I photographed, I tried to lettuce edge the sleeves and hem which is not in the pattern, so that looks different. LIKE: I love the drapey neckline and flouncy sleeves. It is super easy to sew. DISLIKE: The snug fit doesn’t work for me. It looks great on my shoulders, arms, and breasts, but I’m too tubby in the middle for this fit. 90% cotton/10% lycra from Beverly’s, supposedly a swimsuit fabric. I also made one out of a 100% cotton jersey from Joann’s (not pictured). Graded up, and I used a lettuce edge on the sleeves and hems (poor choice for the fabric shown). Even tho it didn’t fit very well, I made another one out of the cotton jersey. I was hoping the lack of lycra would give me a looser fit. It did, but not enough. I really, really like it, even tho it doesn’t fit my middle so well, and either I will lose weight and make more, or I will grade it bigger thru the middle. This is a very attractive, very easy to sew shirt. 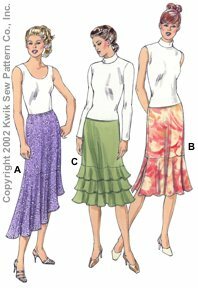 Pull on skirt with 3 flounce options: assymetric (A), tiered(C), and plain (B). I made views A (blue) and B (green). S-XL. I graded up to XXL. Mostly. It isn’t as long, either in the body of the skirt or the flounce as it appears on the envelope. I thought that the cause of that might be that I’m rather fat, but Gigi also thought it was shorter than the pattern envelope indicated. Very easy. I made the skirt exactly as directed. I agree with Gigi that the 3/8 inch elastic is too skim py for a skirt. I tried it to see what it looked like, and Gigi’s assessment that it looks like a slip’s waistband is right on. I love the assymetric flounce. Fun, fun. Even with a 3 month old, a 3 year old, and a husband, I was able to finish this skirt, including alterations, in 2 days. That’s lightning fast for me. 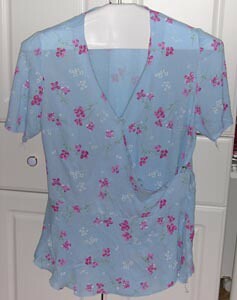 Version A (blue): Lightweight, loose-woven rayon/acetate, almost gauze, from the clearance section at Joann’s. I paid around a $1/yard. This fabric is washable in cold, hang dry, even tho the bolt says to dry clean. Version B (green): I made view B as part of the stash contest. I changed my mind about the 3/8″ elastic and used it again. I lengthened both skirt and flounce by 1″, and finished the hem of the flouce with a rolled hem using a metallic green thread. I’m on the edge a smaller size, but this is one case where the Kwik Sew pattern does not run large. I’m very pleased with this skirt; I like it much better than the one with the assymetric hem. I used the serger to hem the flounce. I lack the patience to do a narrow hem on the sewing machine, but it’s very easy to do on the serger. I used Sandra Betzina’s method on the waistband elastic, butting the elastic ends and zigzagging them together, using a small piece of fashion fabric to wrap the elastic. I find this makes a smoother waistband. Next time I’ll make the body of the skirt longer. Unlike Gigi, I like the length of the flounce. I’ll also use a wider waistband. Also, I think I’ll use a heavier fabric. I’m lumpy, and the skirt clings. A heavier fabric would be pulled down more. Yes, it’s a quick, easy, fun skirt. Next time, I’ll have to remember to check PattenReview BEFORE I make a pattern. I’m pretty sure I ordered this one based on Gigi’s review, but I forgot about lengthening it and making the waistband larger. I highly recommend this pattern. 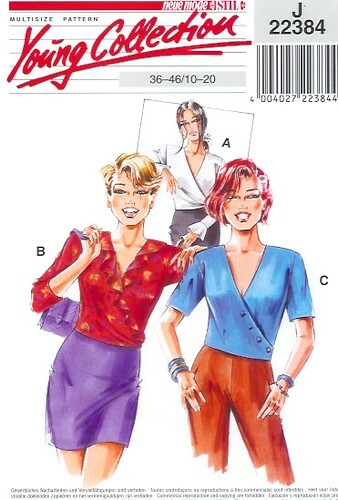 This pattern is OOP, but I was able to order Fall 2002 from The Sewing Place. I wasn’t able to check http://sullivans.net; they’ve changed the website and aren’t showing Neue Mode patterns anymore. Fitted (bust darts and back darts) wrap top with 3 sleeve options and front ruffle option. I chose view C: short sleeves, no ruffles, buttons. Not really. The pattern calls for button loops, but the picture shows buttonholes. I suppose I could have made the holes, but I like to follow the directions the first time. Yes. I was concerned that I would have to dig thru several different language directions, but it was very easy to find and follow the English directions, and, unlike Burda, I didn’t find any funny or weird translations in the directions. The pictures were good, too. Bad I thought the top was tucked in in the pictures, but it’s not. It stops at the waist which isn’t an option for me right now. I’m too tubby there. So it was too short to be wearable by me. I don’t like the button loops. Good It came out very pretty. Light weight, loose weave rayon/acetate blend from Joann’s clearance section ($1/yd). It was almost gauze like. Light blue in color with red flowers and green stems and leaves. Even tho the bolt says dry clean only, I have found these fabrics to be washable in cold, hang dry. They have wonderful drape and are soft and comfortable. I graded the pattern up, lowered the dart, and increased the dart 2 sizes. I guessed that the dart was a C cup because Neue Mode is a European pattern, but the Young Collection in BIG RED letters on the front of the envelope should have clued me in that the cup size was a B. So I didn’t get the cup size right. It really didn’t fit me. I think my bodyshape has changed. I used to be a large size, but similar to smaller women, so I could just grade up. 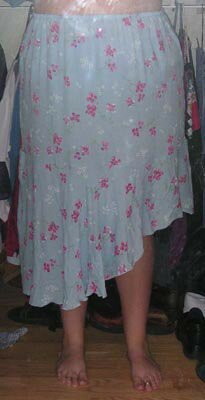 After this last baby, I’ve found that I need more room in the waist and upper arm than regular sized patterns allow. After my alterations, the top was too big across the shoulders and bust even tho the darts were too small, and too small in the waist and upper arms. I added a peplum. I figured this top is a wadder, so why not experiment. The peplum came out pretty good. I used a circle with inner radius of 10 inches and outer radious of 20 inches. I picked those numbers out of the air after asking for some input at a couple of sewing forums. I was pleased with the peplum. 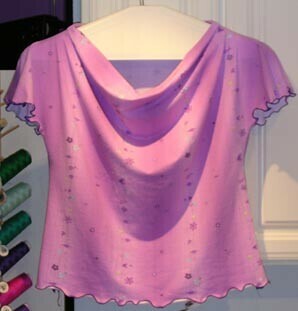 Well, it’s not a good pattern for me, but it’s a very pretty blouse. I think someone who still has her waist would look great in it. Very pretty, but not for me.